This season has seen the deployment of the video assistant referee across major European leagues and cup competitions in England. To say it has been met with resistance would be an understatement, as the system has been universally criticised. However, FIFA has given its backing to the technology, which will be implemented at the 2018 World Cup. Whether it will be of use to the officials in the tournament remains to be seen, although it would rule out the possibility of a ‘Hand of God’ moment against England. The amount of time it has taken to make decisions has been the main issue of contention. Tottenham’s FA Cup fifth-round replay against Rochdale was a testament to its struggles, with several contentious moments taking minutes at a time to decipher – and even then, the decisions were debatable. The problems with VAR could put football’s hierarchy off making further alterations to the game, despite the success of goal-line technology. However, the sport continues to adapt and could continue to take lessons from other sports. The example of goal-line technology has been effectively adapted from tennis, with the review system having already enjoyed a number of years of success in the sport. The VAR system bears similar aspects to cricket’s DRS, although in that sport has become a smooth operation since its inception in 2009. Perhaps the next innovation could come from rugby and the use of sin bin. 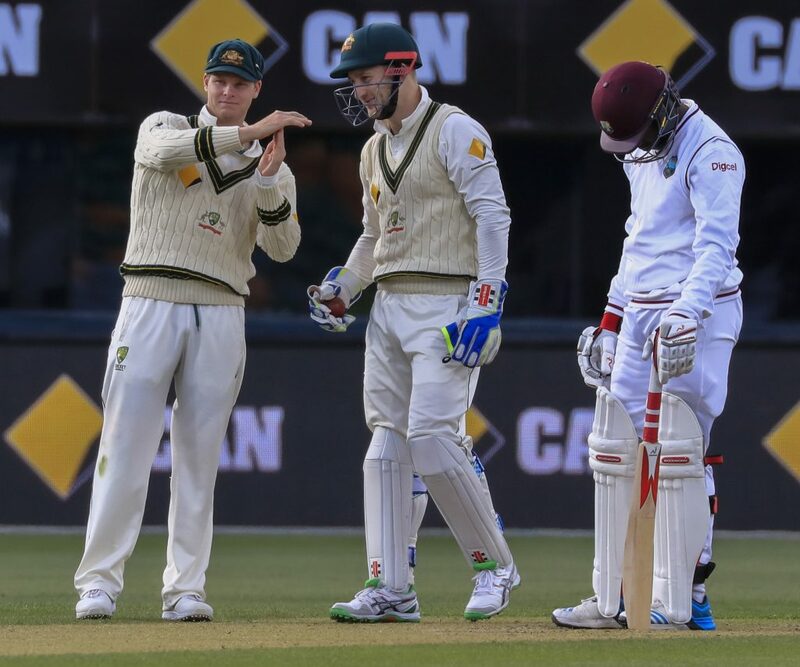 It’s commonplace in both codes of the game that players are sent to the bin for a series of infringements. The red card is rarely seen in rugby, with officials usually taking the course of action to send a player to the sidelines for 10 minutes. It has been a success, providing enough punishment to player and team, but not to the detriment of the quality of matches. How many football matches have been turned by a controversial red card? It’s easy to pick out one or two examples even from the current campaign. 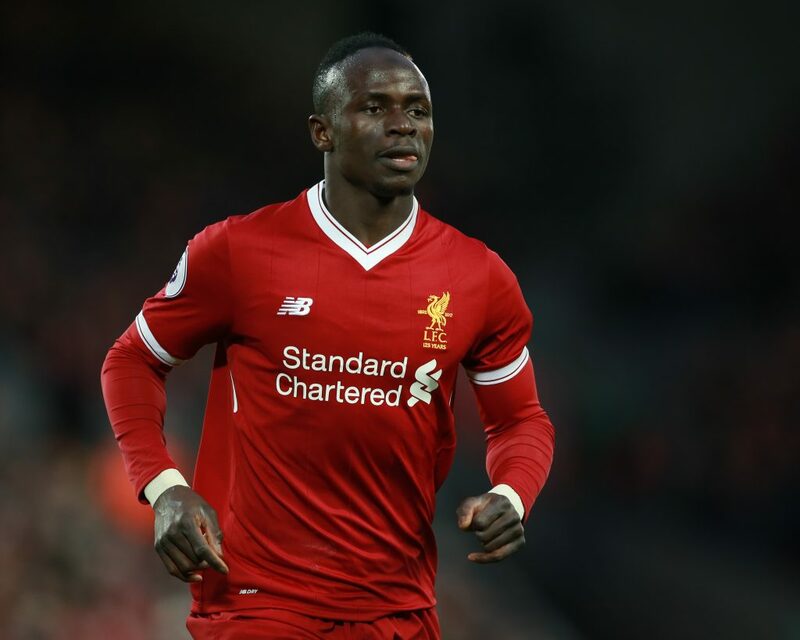 Sadio Mane was sent off for a high boot on Ederson in Liverpool’s defeat at Manchester City in the early stages of the current Premier League campaign. Debate was rife whether the infringement was worthy of a dismissal. City held a 1-0 lead at the time and went on to win the contest 5-0, hammering Jurgen Klopp’s men. Could VAR have prevented Sadio Mane’s game-changing red card when Liverpool faced Man City this season? Given the quality of the match between the two sides at Anfield later in the season, which Liverpool edged 4-3, it’s fair to say that the viewing public were robbed of an entertaining match following Mane’s red card. Had it been reckless and intentional, Mane still would have been dismissed. However, given that the Senegalese had his eyes solely on the ball, a punishment in the sin bin for 10 to 15 minutes would have offered a fair solution and kept the game in the balance. No-one wants football matches to be ruined by decisions early in the match, especially when there are high hopes for an exciting contest. A sin bin could provide an answer from an entertainment point of view, but whether football’s governing bodies would take the plunge is another matter. The system has been criticised in the English football in its usage in the FA Cup. The incident in the clash between Tottenham and Rochdale highlighted flaws, with a great deal of time taken to reach a decision, which was exacerbated by wintery conditions at Wembley Stadium. There were a number of incidents, beginning with a disallowed goal for Tottenham after Fernando Llorente was adjudged to have fouled Harrison McGahey before Erik Lamela scored. The slogan that has accompanied the system has been ‘clear and obvious’. The decision was debatable and the consensus deemed that the goal should have stood, which would have been the case if not for VAR. The next flashpoint came when Kieran Trippier was fouled and referee Paul Tierney awarded a free-kick. However, the system overruled the initial call and a penalty was awarded after a delay. Son Heung-min then scored from the spot, but referee Tierney immediately consulted the VAR. He opted to book Son for feinting in his run-up and disallowed the goal. There were stoppages in the second half, but most were dealt with greater haste than the first period. Match referee Deniz Aytekin consults the VAR system before awarding Italy a penalty during the international friendly match at Wembley Stadium, London. That being said, the accuracy of decision making has not been a huge issue in England. One of the most embarrassing incidents thus far has been Juan Mata’s offside decision. Manchester United thought they had doubled their lead against Huddersfield in their FA Cup clash at the John Smith’s Stadium. The Spaniard latched onto a through ball from Ashley Young before converting. However, the referee chose to use the VAR system to clarify whether Mata was offside when he received the offload. The grid system on the review proved to be a disaster due to a lack of a straight line. The official in the booth put forward a line that was far from straight and, therefore, not clear enough to overturn the ruling. As a result, it was stunning when the officials chose to disallow the goal, much to the bemusement of all spectators. Fortunately, it was not costly for United, who advanced to the next round of the competition anyway. Another controversial VAR incident, which could have England fans sweating ahead of the World Cup, came in the Three Lions’ friendly against Italy at Wembley. Referee Deniz Aytekin used the system when James Tarkowski and Enrico Chiesa collided in the box, sending the Italian to the deck. The officials deemed that it was a penalty, which was converted by Lorenzo Insigne to save the Azzurri from defeat. England manager Gareth Southgate was not convinced by the decision, although it was generally conceded that there was a penalty. It appears that football will not lose the debate over decisions even when the evidence is pretty overwhelming. The important aspect of these decisions is that there have been no absolute clangers that have been reported across England or Europe. Contentious perhaps, but there will always be an aspect of opinion when dealing with human beings in decisions of judgment and the implementations of rules. Perhaps the main issue with the system as it was implemented was not the accuracy of the decision-making, but its effect on the speed of the game. Football is a flowing sport, unlike cricket and the NFL, where stoppages are built into the sport. At its best, end-to-end football is one most of exhilarating viewing experiences in the world of entertainment. As a result, supporters at the grounds and watching at home will not welcome delays with much enthusiasm. The same impact has been felt with cricket and the NFL in terms of time taken to make a decision. The ‘clear and obvious’ slogan has to be the staple of the system. There has to be a consideration for the spectators inside the stadium, especially on freezing cold nights like the one experienced at Wembley in the contest between Spurs and Rochdale. A time limit may improve VAR, highlighting the ‘clear and obvious’ nature. If you cannot see the mistake immediately or over the course of 30 seconds, then the decision should remain with the referee’s initial call. The NFL has experienced this with the infamous ‘catch rule’ replay. Big games have been decided up in the booth rather than with the call on the field, which is fine if it’s contemporaneous and correct. 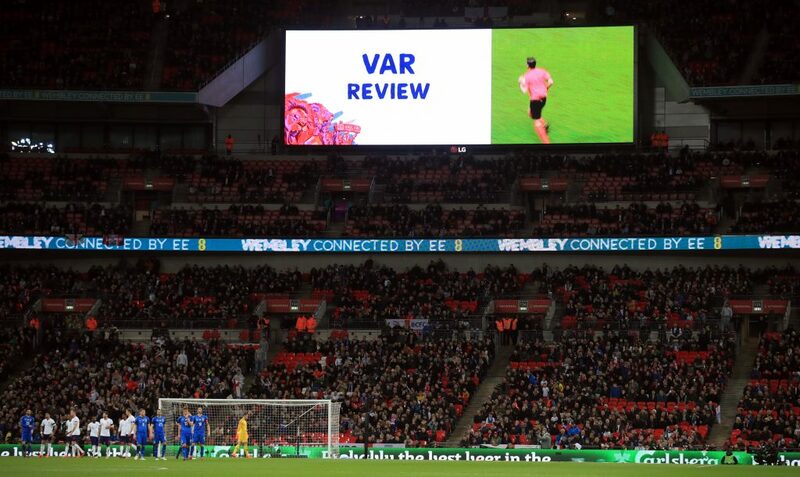 The LED Screen alerts the crowd to a VAR review, resulting in a penalty for Italy, during the international friendly match at Wembley Stadium, London. A study taken by IFAB and KU Leuven looked at the 972 competitive matches that have used VAR across over 20 national associations since March 2016 has deemed that the average time taken to make a decision was less than a minute. It came to the conclusion that 69.1% of matches experienced no reviews, while only 5.5% of matches endured more than one usage of VAR. Importantly, the types of review carried out were for red card and goal decisions. For that sort of incident, the time take to complete the check was only 35 seconds, which could fall into the timeframe of a ‘clear and obvious’ decision. Considering the time that is wasted in matches with substitutes, which in the study were recorded at two minutes and 55 seconds and goal-kicks at five minutes and 46 seconds, 55 seconds to complete a VAR check seems like no time at all. However, one area that should be improved is communication with supporters. For the faults of the NFL system, one area that has been outstanding has been the relaying of information to the fans inside the stadiums as well as the viewing public at home. All referees use microphones to explain what passage of play is being examined and how the rule of the sport was implemented in the call. In the instance of the Tottenham game, a simple explanation from the referee or on a big screen, which are present inside all major grounds, would be welcome and perhaps ease the annoyance from supporters. 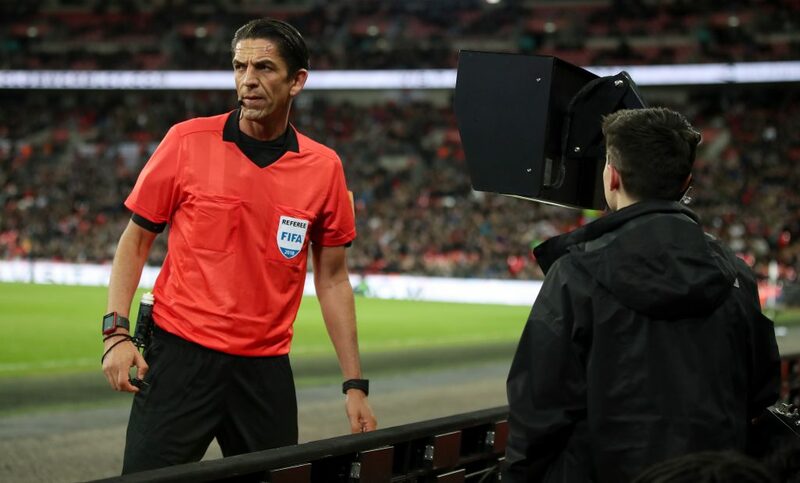 There will be issues with any new system and there is no doubt that VAR needs fine tuning, but has, at the least, shown promise in its debut outing.